To discern means to sift, to separate, and to distinguish. Discernment is navigating the multitude of life options available to you and choosing the ones that fit you. It isn’t about adopting what is popular or in fashion. It isn’t going with the flow without reflecting on what feels right for you. Discernment is highly personal and you develop it by developing a relationship with yourself. You develop it by becoming aware of your soul, becoming aware of what makes you thrive, and what makes you weak, unhealthy, and unhappy. When we practice mindful discernment we feel in alignment with our world. We feel at peace, even when things may not be going that great. The more you practice discernment the more you realize what a waste of time it is to worry ourselves about the behavior and choices of others. Why? Because we are each unique. Our individual needs, loves, dislikes, health, and joy can rarely be duplicated onto someone else with any degree of success if the goal is personal fulfillment. It is a waste of time to try to determine what is best for another person when you finally realize how personal our choices must be if we want lasting happiness. Go on, look at what moves you. Notice what hurts you. Nurture what excites you. Take the time to develop your discernment for in discernment you can live an honest, authentic life. 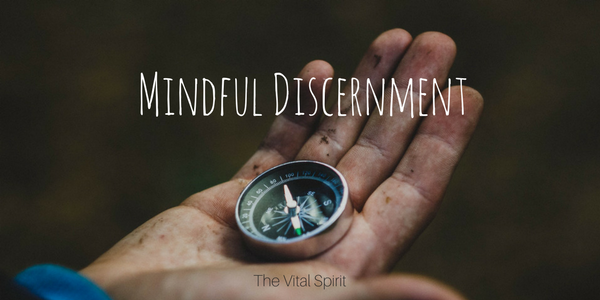 In mindful discernment, you find peace, strength, and confidence.